Most of the schools and offices have intercoms to communicate with people inside a building or a particular campus. These are just like landline phones but, you do not need an operator, the voice received from one end will be directly transferred to the receiver on the other end. 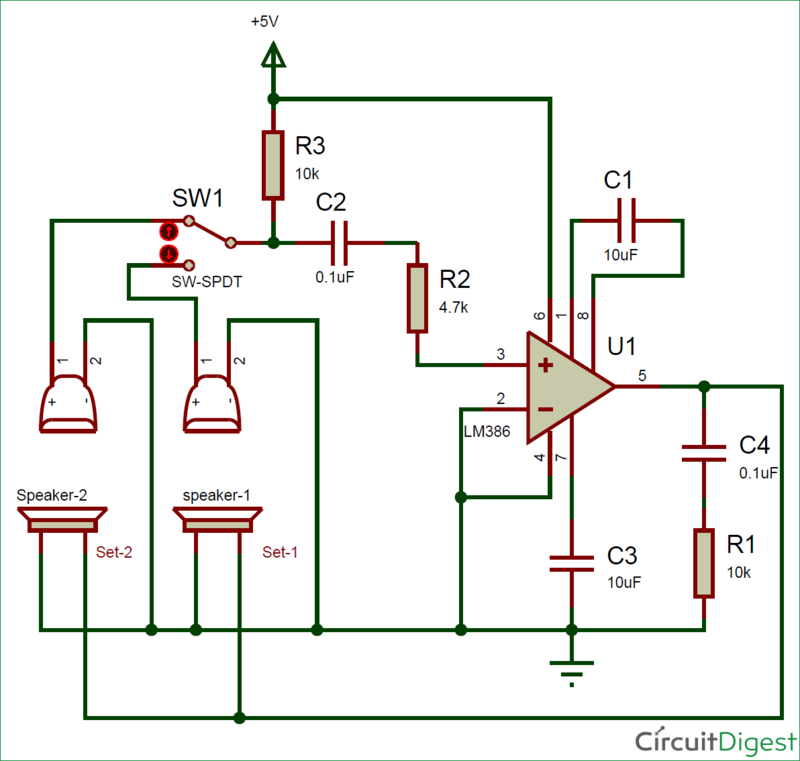 In this circuit we are going to build a very Simple Intercom Circuit using which you can communicate two ways locally within your house or school. This project brings in the childhood memory of using matchboxes with thread to build a simple telephone. So now let’s take it to the next level by building an electronic circuit (amplifier) to transmit voice from one end to another end. The complete circuit diagram of this Intercom Project is given below. As you can see the circuit is very simple and can be easily built over a breadboard. 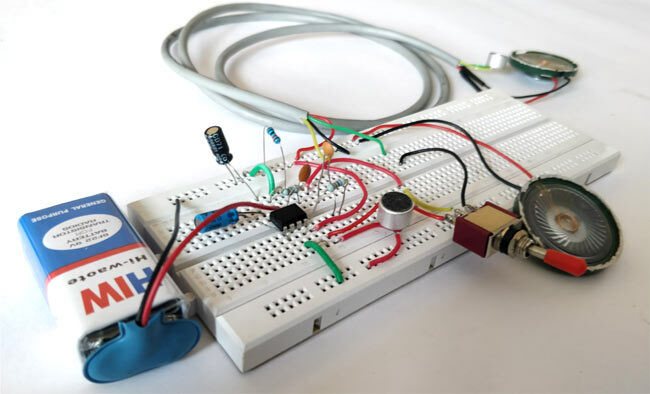 The main concept behind the circuit is the use of LM386 audio amplifier which receives the audio signal from microphone, amplifies it and plays it on the speaker. The LM386 has a gain range from 20-200; by default the value of gain is 20 but can be increased upto 200 by using a capacitor across the pins 1 and 8. Here we have used a capacitor of 10uF to get the maximum gain of 200. The resistor R2 is used to control the volume of the speaker; here I have limited the volume to medium level using a 4.7K resistor. You can experiment with values from 1k-100k to get the volume of your choice. The output of the amplifier (pin 5) is connected to both the speakers. One speaker will be used in set-1 and the other in set-2 as show in the circuit diagram. The input of the amplifier is the microphone (microphone has polarity so be careful while connecting it), We cannot amplify the sound from both the microphone at the same time, so we use a SPDT (single pole double throw) switch as shown above. The SPDT switch will connect only one microphone to the amplifier at a time. So only one person can talk at a time, this type of communication is called half-duplex communication and this is what we see in walki-talkies. Each time after speaking something the user has to flip this SPDT switch for the person on other end to start talking. The complete circuit is built on a bread board, and is powered by a 9V battery. The circuit can also run on voltage between 5V to 12V so choose a power supply which you are comfortable with. Now place the SPDT switch in a position and speak into the respective microphone your voice should be echoed on both the speakers. Similarly place the switch in opposite position and talk into the other microphone and check if you can hear the sound on the speakers. Initially you can experiment with the circuit by blowing air into the microphone and check if the speaker produces some noise. You can also upgrade this project by adding another SPDT switch to turn of the speaker on your side when you are talking. Right now both the speakers will always be active to keep things simple, so do not worry if you hear yourself on the speaker on your end. The complete working of the project is shown in the video below; you can also go through it if you are confused on how to use it. Hope you understood the project and got it working, if not feel free to use the comment section or the forums to post your doubt and I will try my best to resolve it. How to change possitive supply to negative supply. Simple way needed. if u notice properly the output pin should be 6 not 5. The circuit is not working. Circuit diagram and the photograph you kept are different in connections. Two things. First, there is no output coupling capacitor for the 386. This will cause a continuous, large DC current through both speakers. The extra power dissipation in the 386 will shorten its life greatly. Second, both speakers are active at the same time. This means that at each station, depending on the exact placement, the local mic and speaker might form an acoustic feedfback loop and howl.